Triclosan is a widely used broad-spectrum anti-bacterial agent. The objectives of this study were to identify which cytochrome P450 (CYP) isoforms metabolize triclosan and to examine the effects of CYP-mediated metabolism on triclosan-induced cytotoxicity. A panel of HepG2-derived cell lines was established, each of which overexpressed a single CYP isoform, including CYP1A1, CYP1A2, CYP1B1, CYP2A6, CYP2A7, CYP2A13, CYP2B6, CYP2C8, CYP2C9, CYP2C18, CYP2C19, CYP2D6, CYP2E1, CYP3A4, CYP3A5, CYP3A7, CYP4A11, and CYP4B1. The extent of triclosan metabolism by each CYP was assessed by reversed-phase high-performance liquid chromatography with online radiochemical detection. Seven isoforms were capable of metabolizing triclosan, with the order of activity being CYP1A2 > CYP2B6 > CYP2C19 > CYP2D6 ≈ CYP1B1 > CYP2C18 ≈ CYP1A1. The remaining 11 isoforms (CYP2A6, CYP2A7, CYP2A13, CYP2C8, CYP2C9, CYP2E1, CYP3A4, CYP3A5, CYP3A7, CYP4A11, and CYP4B1) had little or no activity toward triclosan. Three metabolites were detected: 2,4-dichlorophenol, 4-chlorocatechol, and 5′-hydroxytriclosan. Consistent with the in vitro screening data, triclosan was extensively metabolized in HepG2 cells overexpressing CYP1A2, CYP2B6, CYP2C19, CYP2D6, and CYP2C18, and these cells were much more resistant to triclosan-induced cytotoxicity compared to vector cells, suggesting that CYP-mediated metabolism of triclosan attenuated its cytotoxicity. 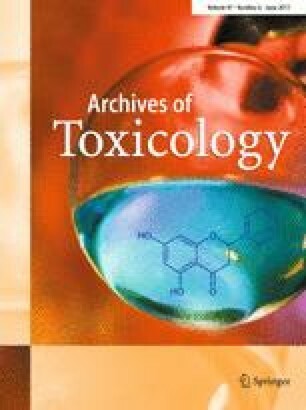 In addition, 2,4-dichlorophenol and 4-chlorocatechol were less toxic than triclosan to HepG2/vector cells. Conjugation of triclosan, catalyzed by human glucuronosyltransferases (UGTs) and sulfotransferases (SULTs), also occurred in HepG2/CYP-overexpressing cells and primary human hepatocytes, with a greater extent of conjugation being associated with higher cell viability. Co-administration of triclosan with UGT or SULT inhibitors led to greater cytotoxicity in HepG2 cells and primary human hepatocytes, indicating that glucuronidation and sulfonation of triclosan are detoxification pathways. Among the 18 CYP-overexpressing cell lines, an inverse correlation was observed between cell viability and the level of triclosan in the culture medium. In conclusion, human CYP isoforms that metabolize triclosan were identified, and the metabolism of triclosan by CYPs, UGTs, and SULTs decreased its cytotoxicity in hepatic cells. The online version of this article (doi: 10.1007/s00204-016-1893-6) contains supplementary material, which is available to authorized users. Yuanfeng Wu and Priyanka Chitranshi were supported by an appointment to the Postgraduate Research in the Division of Biochemical Toxicology at the National Center for Toxicological Research administered by the Oak Ridge Institute for Science Education through an interagency agreement between the US Department of Energy and the US Food and Drug Administration.